Jasen Kattle displays the variety of awards won in recent years. The Craig native won a bench press competition in February for the fourth straight year, surpassing the lift he had when he set a state record in the bench press. Jasen Kettle would be hard-pressed to find something he doesn’t like about the weightlifting world. The Craig native and 2010 Moffat County High School graduate has spent the past several years building his strength and power, narrowing his focus and racking up some impressive numbers. Jasen recently won the Jack Robinson Lifting Classic in Greeley for the fourth straight year in the bench press event with a lift of 345 pounds, more than twice the body weight of the 27-year-old, whose frame tips the scales at 155. 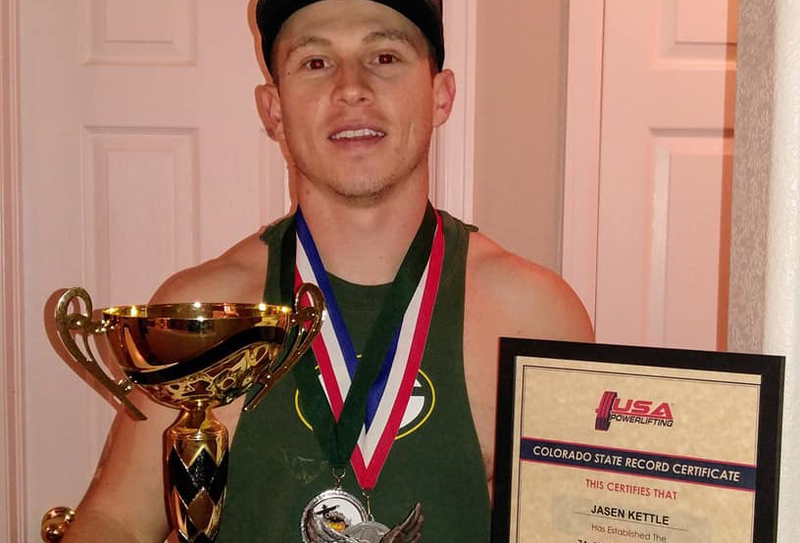 However, the feat was only one of many he has achieved in recent years, which includes setting a Colorado record — certified by United States Powerlifting Association — in September 2017, when he hit a mark of 342 at his then-body weight of 156 at the Colorado Fall Open. His state record has since been broken, and since the recent lift was not at an official event, his new best was not technically recognized. Still, the accomplishment meant a great deal to Jasen, who has been honing his body for most of his adult life, which largely started in the MCHS Bulldog weight room for sports including football, baseball and track. He also credits his dad, Dale, with getting him on the path, as well as the namesake of the Jack Robinson Classic. “He was the one who introduced to the idea of doing it as a competition,” he said. Though he has a good crew of supporters in the gym, he does a lot of his training solo. Outside of his physical pursuits, Jasen studied earth science and geology at University of Northern Colorado and works for West Greeley Conservation District, which works with rural landowners and city dwellers in the area and educates on soil health, erosion, and land preservation, among other agricultural topics. “Not really a lot of heavy lifting in that job,” he laughed. Though he’s less interested in full-fledged bodybuilding, Kettle is also hoping to build his capabilities beyond the bench, such as deadlift and squats. Jasen added he thanks his wife, Kaylee, and his parents, siblings and friends for the support they provide regularly on the path to getting increasingly stronger. And, he’ll continue to be on the lookout for Front Range events to keep pushing to new bests. “As long as they’re having competitions in the area, I’ll be looking for them,” he said.